DiversityCollection (see Databases for further information). The Data Form tab sheet can be used to display and enter data. One can also use the Data Form tab sheet to page through selected records a single record at a time. Each of the data windows focuses on a different type of data. The data form displays fields relevant to the current window. 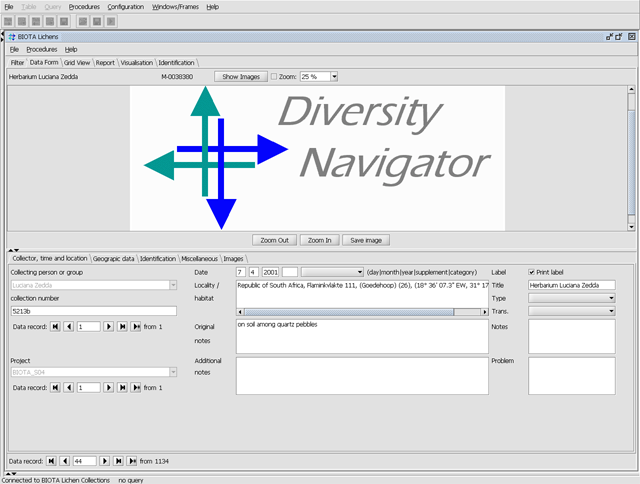 "DiversityCollection Editor" oder "DiversityCollection Form"
Wie genau sollten die Tab-Sheets beschrieben werden? Jeweils eine Tabelle mit Feldnamen und kurzer Beschreibung oder genügt ein Link zum Datenmodell? Was bedeuten die roten Felder? This page (revision-1) last changed on 11:51 15-Feb-2007 by unknown.